This website is dedicated to the memory of Lily Sateriale (5/28/10 – 2/16/12), who was lost to Sudden Unexplained Death in Childhood (SUDC) at 20 months of age. In addition to paying tribute to her life, we will share news with our friends, family, and local community about fundraiser events we plan to hold in the future. Previously held events are listed below. It’s not too late to fund SIDS and SUDC research at Boston Children’s Hospital in connection with our Lily’s Irish Party fundraiser! Click here to donate now! What’s next? We hope to hold another fundraiser during the Christmas season of 2019 or 2020 with a cookie walk and/or bake sale, photos with Santa, and holiday craft vendors. As in previous events, all proceeds would benefit SIDS and SUDC research at Boston Children’s Hospital. If you’re interested in joining us in this future effort, email us at eventsforlily@gmail.com. 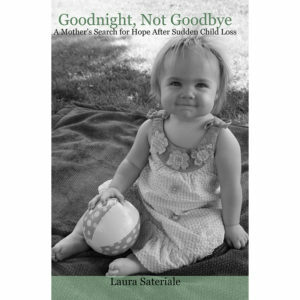 Goodnight, Not Goodbye is a raw, emotional testament to a mother’s love, and an honest account of SIDS / SUDC loss. Over the course of five years, Laura shares how she learned to cope with grief and the new normal she faced with her family. Featured on the SUDC Foundation’s recommended reading list, Syracuse Woman Magazine, and the Eagle Star Review in Baldwinsville, NY. On Saturday, September 29, 2018, we held Lily’s Irish Party, a night of live Irish music and dance with Fintan Stanley! This event raised a grand total of $1,728 for SIDS and SUDC research at Boston Children’s Hospital. 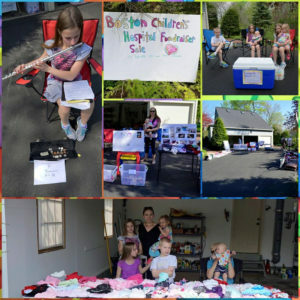 In May, 2015, our family held a yard sale fundraiser in the Radisson Community of Baldwinsville, NY. The sale, along with online contributions, raised a total of $662 for SIDS and SUDC research at Boston Children’s Hospital. 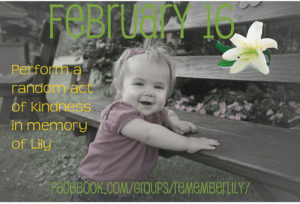 On February 16, 2014, we asked friends of our (now archived) Facebook group to perform a random act of kindness. The response was both inspiring and overwhelming! On September 23, 2012, we hosted Lily’s Walk for Answers. The walk included a silent auction and raffle. This community event raised a total of $13,058 for the SUDC Program (now SUDC Foundation).